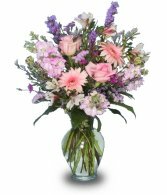 Millers Flowers is a local Muncie, Indiana Florist that has been family-owned and operated since 1929. Let our professional designers create a floral arrangement for you. Whether you prefer classical, contemporary or country styles, we can create masterpieces with flowers for you. Along with a beautiful variety of fresh flowers, we also offer green plants, blooming plants, dish gardens and a vast gift line. Choose from our large selection of African American designs, cherubs and angels, silk arrangements, plush stuffed animals and specialty balloons. Planning a wedding? Let our designers create the wedding of your dreams, whether you prefer a small intimate ceremony or the social event of the season. Call our shop at 765-284-9704 to schedule your consultation. Millers Flowers is open Monday through Friday 9:00 to 5:00 and Saturday 9:00 to 12:00. Closed Sunday. We offer daily deliveries to Ball Memorial Hospital, Meeks Mortuary, Parson’s Funeral Home, Carmichaels Funeral Home, and Faulkner Funeral Home.